This dish is from India Hyderabad, which is famous for its aromatic and mouth watering dishes. 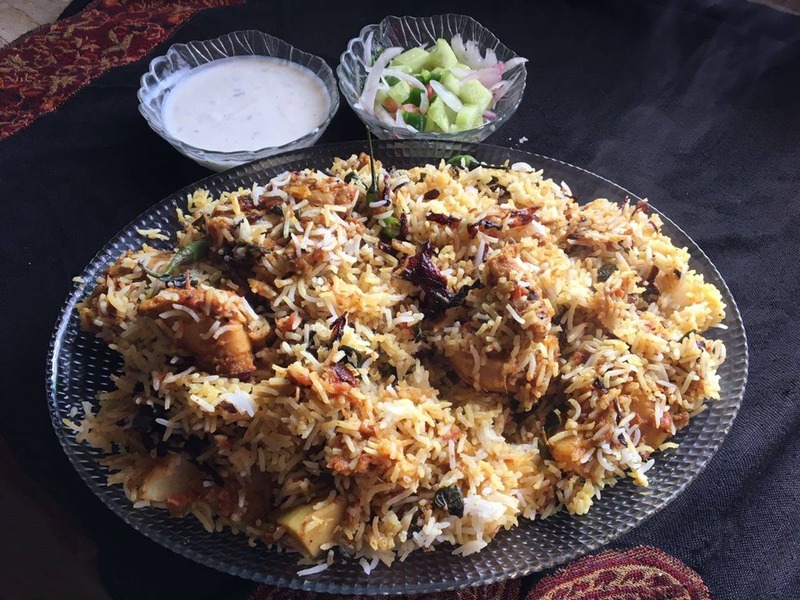 Hyderabadi Biryani is also known as kachay gosht ki biryani but that we make with different recipe. This biryani is not much spicy but you can adjust spices according to your taste. Heat oil and add chopped onion, stir fry till brown, add ginger garlic paste with chopped tomatoes and fry well. Add yogurt with salt, chili powder, coriander powder, turmeric powder, all spices powder and chicken, fry well for 10 minutes add 1 cup water and yogurt cover and cook till chicken tender and thick gravy left. Heat water in a pot and boil rice with some salt till they are 3/4 cooked. Drain the water. In a large pan spread half rice, chicken, fried onion, mint, top with remaining rice. green chilies and fried onion cover and leave it for dum for 15 minutes.